L'Agence Highline High Waist Fray Hem Skinny Jeans $265 Free US shipping AND returns! Levi's Wedgie Icon Fit High Waist Ripped Skinny Jeans $98 Free US shipping AND returns! 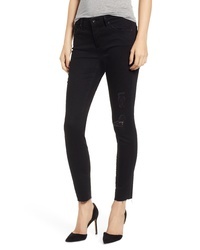 Grlfrnd Karolina Ripped Rigid High Waist Skinny Jeans $248 Free US shipping AND returns! Sam Edelman The Stiletto High Waist Lace Hem Ankle Skinny Jeans $118 Free US shipping AND returns! Topshop Jamie Wing Rip Skinny Jeans $80 Free US shipping AND returns! AG The Legging Super Skinny Jeans $198 Free US shipping AND returns!